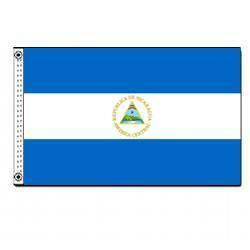 Nicaragua’s flag, adopted in 1971, is based on that of the United States of Central America. The two blue stripes represent the Pacific Ocean and Caribbean Sea as well as justice and loyalty; white stands for peace, virtue, and purity. The government version of this flag includes Nicaragua’s coat of arms: an equilateral triangle, for equality, featuring 5 volcanoes, one for each member of the disbanded federation. It also includes the Cap of Liberty and rainbows and sunrays, symbols of a bright future.